Inside a typically crowded dining area, Tom Lange found a secluded space to sit. He faced the expanse of the familiar Millennium Student Center at the University of Missouri–St. Louis, but between semesters there wasn’t much for the longtime employee to gaze at. The tables surrounding him were empty. Yet within a few minutes, he still acknowledged at least a half dozen passersby with signs of familiarity. He gave some of the acquaintances a jovial nod, others a friendly handshake. 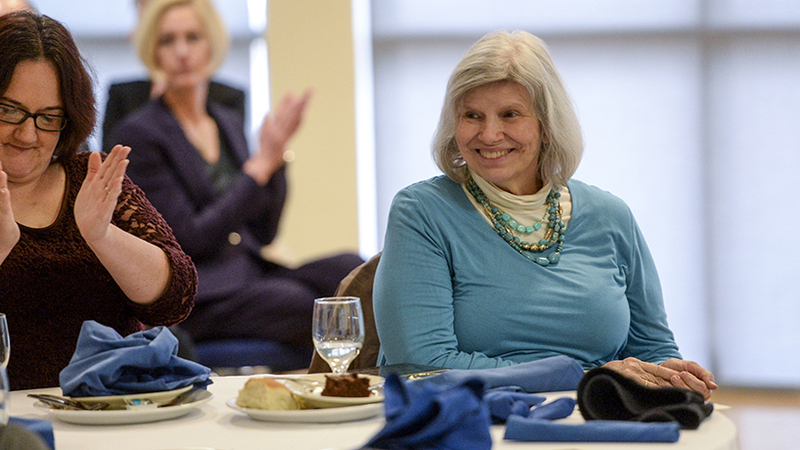 After 22 years at UMSL, Lange had a lot of people to share the news with. Some of those Lange hoped to tell knew him as one of UMSL’s veteran mail carriers. Others recognized him as “The Hat Man,” a frequently photographed fan of the St. Louis Cardinals. Those who were lucky enough knew both pieces of Lange’s identity. “Over the years, you do develop those relationships and the face recognition,” Lange said before retiring last week. “I’ve been very blessed here, and I’ve really been amazed at how much of the gratitude has come back also. Lange first came to UMSL in 1996 to join the facilities management team. He spent seven years working in the department purchasing various parts – light bulbs, ceiling tiles, pipe fittings – to complete work orders. 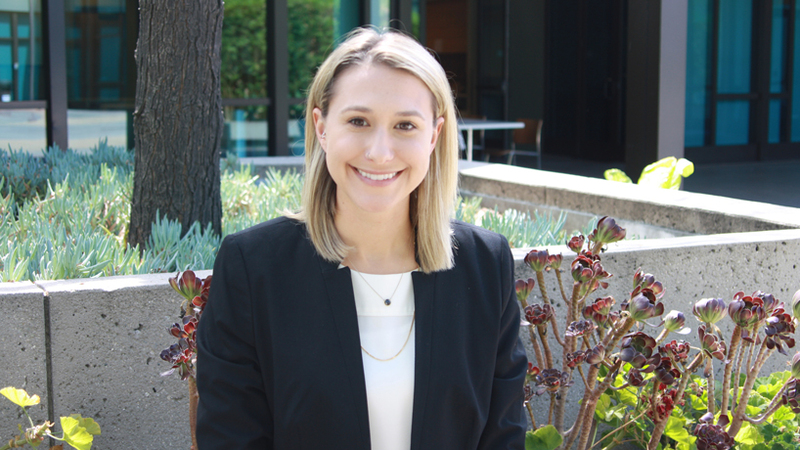 He enjoyed the role but didn’t take time to explore campus or get to know others outside of his department. Looking for a change, he transferred to the UMSL grounds crew. He was happy working around areas all over campus, but after a few years, his arthritis proved to be too much to continue. 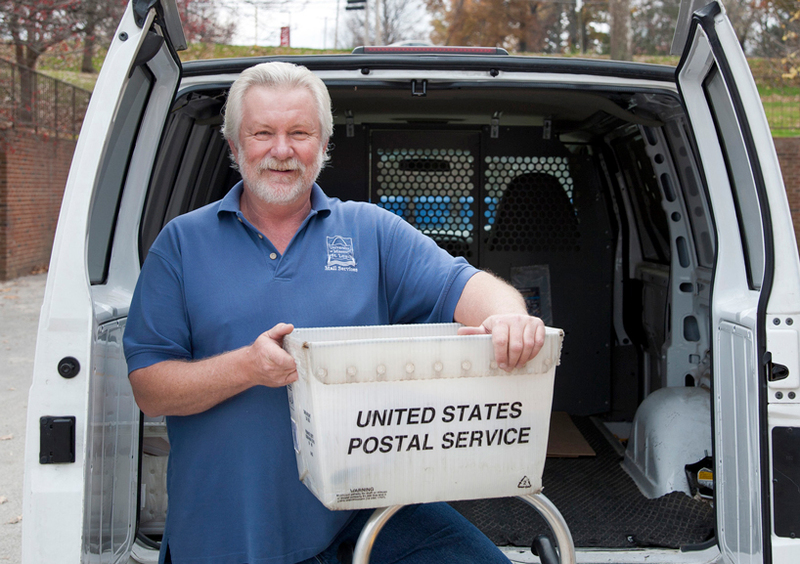 The right position came along in 2004 through an opening in UMSL Postal Services. Tom Lange worked in the mail room for 14 of his 22 years at UMSL. When he retired, his delivery route included Woods Hall, the Millennium Student Center, the Recreation and Wellness Center, Clark Hall and the J.C. Penney Building. During his workday delivery routes, Lange tried to further spread joy around campus through his optimistic outlook, sincerity and the occasional conversation about his favorite baseball team – the St. Louis Cardinals. Outside of UMSL, Lange is known as one of St. Louis’ legendary sports fans. The lifelong St. Louisan has been handcrafting Cardinals-themed hats since 2006. His eye-catching, intricately designed caps are a spectacle on Opening Day each year as fans, stadium staffers and franchise officials all try to get a peek at Lange’s latest creation. He’s crafted 25 figurine- and boa-covered Cardinals hats to date, premiering a new one at the beginning of each season and making others to celebrate various team events. He started the tradition as an almost desperate attempt to attend the inaugural game in the new Busch Stadium in 2006. At that time, he hadn’t missed an Opening Day in 20 years, so he experienced a rare fit of anger when he couldn’t get tickets. The experienced fan began brainstorming other ways that he could get into the game, and inspiration struck. He would attend a pregame pep rally in a quirky hat dedicated to the opening of the stadium and hopefully catch the eye of someone giving away tickets. The gimmick didn’t work, but Lange thinks the hat brought him luck in other ways. His hat collection has served as a catalyst to meet every living Cardinals Hall of Famer, he was recognized as the best Major League Baseball fan in 2013, and a book documenting his hats is in the St. Louis Cardinals Hall of Fame Museum. After 12 seasons, Lange still can’t fully explain where he finds the inspiration for his hats. Some years the direction is obvious, like his 2007 cap that memorialized the Cardinals’ 10th World Series title. In other years, he has to channel a more creative energy. Tom Lange’s 2018 opening day hat is inspired by his retirement. The cap honors the former players and club personnel whose jersey numbers have been retired by the Cardinals organization. His 2018 hat features franchise favorites whose jersey numbers have been retired – a tie to the conclusion of Lange’s career. Making each hat is a tedious process as he sometimes spends years searching for all of the right additions. He also wires each of the pieces, adding value but also a little blood to his craftsmanship. 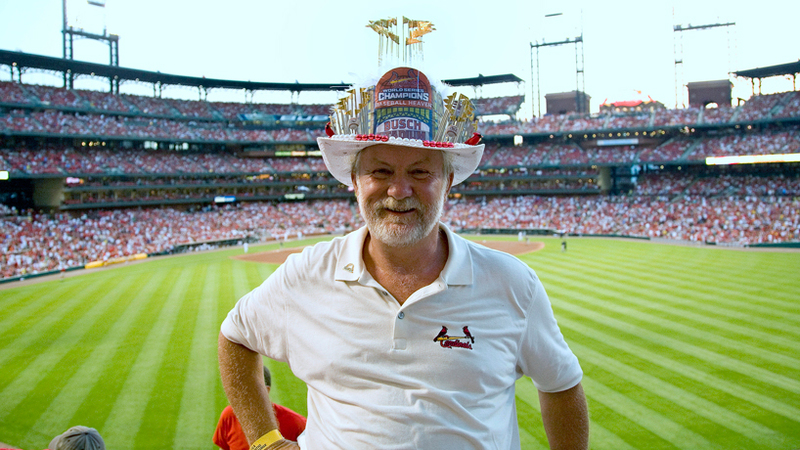 With the positive reception Lange receives from his headwear, he hasn’t been to a Cardinals game without one his creations since premiering his 2006 hat. But he admits he’d rather go without one. “You know what, I’m a hair guy,” Lange whispered as if it were a secret. “I spray my hair. I do my hair. I’m not really a hat guy. 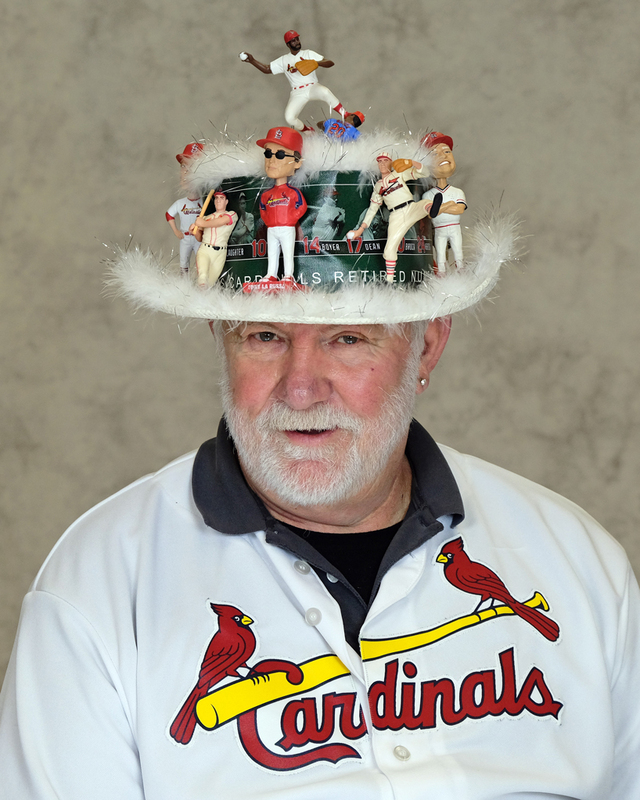 Until his retirement, Lange displayed his hats at UMSL for others to enjoy. He first housed them in the hallways of the Millennium Student Center before bringing them to the UMSL Postal Services building. His collection is now split between his house and his mother’s while he searches for a more prominent area to display them. He hopes to find a home for them somewhere near Busch Stadium. 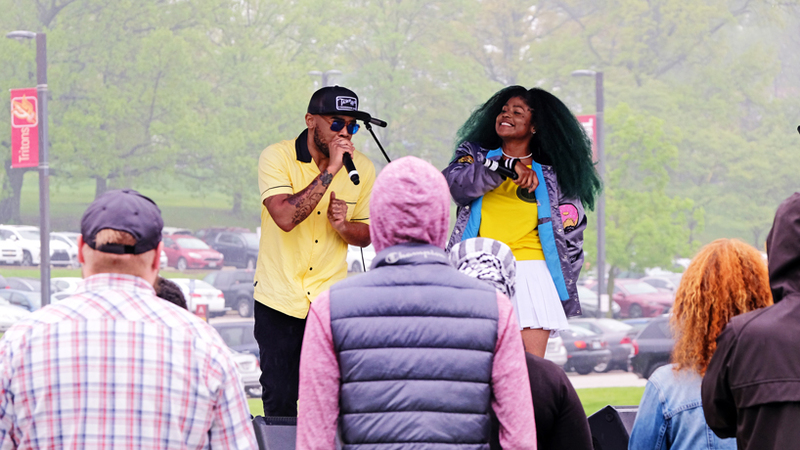 While the hats and Lange are no longer at UMSL, he hopes he’s left an impact on the university community.